Kansas State's Shane Southwell had 21 points in the Wildcats' win over George Washington on Tuesday. 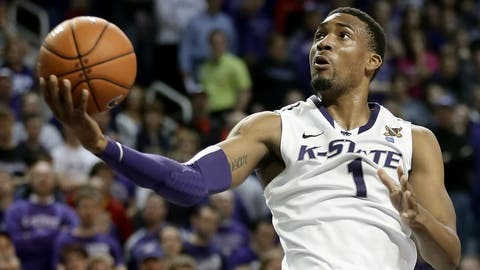 MANHATTAN, Kan. — Shane Southwell had 21 points and Thomas Gipson had 12 points and eight rebounds as Kansas State beat George Washington 72-55 on Tuesday. Five quick points courtesy of Marcus Foster stretched the Wildcats (10-3) lead to 18 less than two minutes into the second half and it never fell under 15 the rest of the way. The victory stretches Kansas State’s winning streak to eight games and gives Southwell his first 20-point performance of the season. It’s also the 11th time in its last 12 games that Kansas State’s opponent has been held under its scoring average. George Washington (11-2) entered the contest averaging 77.7 points per game. Kethan Savage had 12 points to pace the Colonials and leading scorer Maurice Creek contributed 11 points. The Colonials 34 percent shooting performance was their worst of the season and just the third time they had been held under 40 percent. The Wildcats quickly negated the Colonials’ opening 15-6 run by going on a 20-0 run of their own. Southwell’s 14 first-half points ignited the run while Williams and Gipson each tallied eight points. A Kethan Savage basket cut the lead to nine as it ended George Washington’s seven-minute scoring drought. The Colonials were unable to find a defensive plug as the Wildcats stretched the lead back to 13 at the break. Omari Lawrence and Nino Williams aided the Wildcats’ first-half performance with 13 bench points and Kansas State’s 43 first-half points surpassed its previous season high of 40 against Central Arkansas on Dec. 1. The Colonials entered the contest with the nation’s 20th ranked 3-point shooting offense and they were limited to 20 percent (3 for 20) on the afternoon. Jevon Thomas had six assists in only his second game of the season and Kansas State’s season-high 20 assists were its highest since facing Baylor at home on Jan. 20, 2012. Kansas State’s 16 fouls muddied the second half, but the Colonials were only able to convert 10 of 21 from the free throw line.